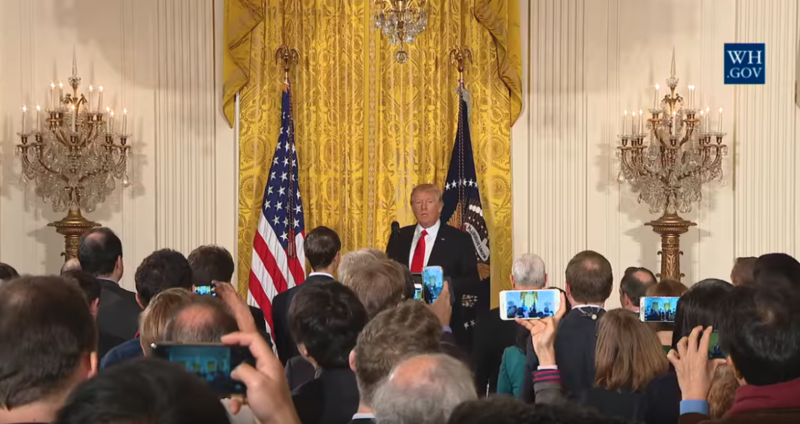 President Trump is pictured opening a press conference in this screen shot of an official White House video on YouTube. InDepthNH.org will post your opinion as news consumers along with our editorial that day. Please email your brief letter to the editor to executive director Nancy West at nancywestnews@gmail.com and include your name, contact information and the town where you live. InDepthNH.org is proud to stand with journalists everywhere who work hard to inform the public and encourage civil conversation and civic participation. This dirty war on the free press must end. The Boston Globe is reaching out to editorial boards across the country to propose a coordinated response. The Globe proposes to publish an editorial on Aug. 16 on the dangers of the administration’s assault on the press and ask others to commit to publishing their own editorials on the same date. Publications, whatever their politics, could make a powerful statement by standing together in the common defense of their profession and the vital role it plays in government for and by the people. The impact of Trump’s assault on journalism looks different in Boise than it does in Boston. Our words will differ. But at least we can agree that such attacks are alarming.